BYU completes its study on sexual assault and implements recommendations. After six months of talking to experts, reviewing feedback, and examining relevant literature and guidelines, BYU’s Advisory Council on Campus Response to Sexual Assault completed its study in October. With the release of the report, President Kevin J Worthen (BA ’79, JD ’82) reiterated BYU’s commitment to creating “an environment where sexual assault is eliminated” and announced that the BYU President’s Council accepted all of the council’s 23 recommendations. • Create a new, full-time Title IX coordinator position to replace the existing part-time Title IX coordinator position. • Create a victim advocate/confidential advisor position. • Create a new space to house the Title IX Office separate from the Honor Code Office. • Ensure that, unless the health or safety of others is at risk, the Title IX Office does not share information with the Honor Code Office about the complainant without the complainant’s consent. • Adopt an amnesty clause. The recommended amnesty clause prevents victims or witnesses from being disciplined for Honor Code violations occurring “at or near the time of the reported sexual misconduct unless the health or safety of others is at risk.” Such a clause, the council noted, will encourage increased reporting and ultimately create a safer campus environment. Because this recommendation involves a change in policy, the clause will be reviewed by the Student, Faculty, and Administrative Advisory Councils before becoming policy. In the meantime the university is operating under the recommended guidelines. The Advisory Council was formed under Worthen’s direction in May, after concerns were raised about BYU’s sexual-assault reporting process. It was led by Janet S. Scharman, a licensed psychologist and BYU’s student life vice president. 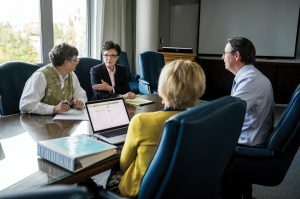 Other council members were Sandra Rogers (BS ’74), international vice president and former dean of the College of Nursing; Ben M. Ogles (BS ’85, PhD ’90), dean of the College of Family, Home, and Social Sciences; and Julie L. Valentine, a nursing professor whose research focuses on sexual assault and violence against women. Janet S. Scharman, BYU’s student life vice president and a licensed psychologist, served as chair of BYU’s Advisory Council on Campus Response to Sexual Assault. At the time the council released its report, she answered questions about its process and outcomes. Q: What did the Advisory Council consider in its deliberations? A: Advisory Council members spent several months and literally hundreds of hours meeting with individuals and groups (including victims and complainants, community partners, campus organizations, and national experts); studying federal guidelines, relevant literature, Title IX policies, and structures from other universities; reading nearly 3,200 comments posted on a BYU feedback website established for this purpose; and then meeting together to discuss what kinds of changes, additions, or re nements we would recommend to current policies and practices. Q: What do the Advisory Council’s recommendations mean for BYU students? A: Our overarching goal is to provide for our students a positive, safe, and supportive environment in which they can study, work, and live. . . . Consistent with this goal, we are recommending increased resources, enhancement of current support systems, and a broad educational campaign regarding the assistance we want to offer to all in our campus community. Q: Why was there a need for improvement? A: There are nearly 300 open cases that the U.S. Department of Education’s Office for Civil Rights is currently investigating at higher-education institutions. It’s evident that handling sexual-assault reporting is a complicated and evolving issue. We continue to make improvements that we believe will make a difference in limiting sexual assault here. Q: What was the Advisory Council’s reasoning for recommending an amnesty clause? A: Ultimately, two major factors influenced this recommendation: (1) Sexual assault is underreported. We cannot offer help and support to those traumatized by such a crime if we are not aware that such a crime has occurred. (2) National research suggests that as many as 60 percent of all perpetrators are repeat offenders. Our hope is that if we are able to encourage reporting of sexual assault, we may be able to intervene more quickly, thus making our campus safer. A: The efforts of the Advisory Council reinforced for us that this is a complicated issue and that our efforts to respond compassionately to victims and make our campus safer will be an ongoing process. The President’s Council has accepted our report and will begin to implement five major recommendations immediately, and additional recommendations will be put into effect following our normal procedures. Q: How has this process left you feeling about the future of this issue at BYU? A: I have been impressed with the large number of our faculty, staff, and students who so passionately expressed concern and love for anyone who has been abused. 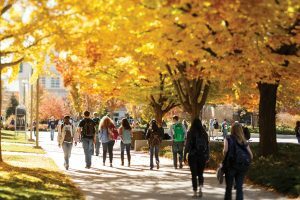 A number of excellent campus resources are already in place, and I’m optimistic that we can and will make progress in meeting President Worthen’s charge to work toward the elimination of sexual assault on campus as we find better ways to sensitively and compassionately support victims. Religion professor Kerry Muhlestein believes in asking hard questions about LDS Doctrine and Church history.